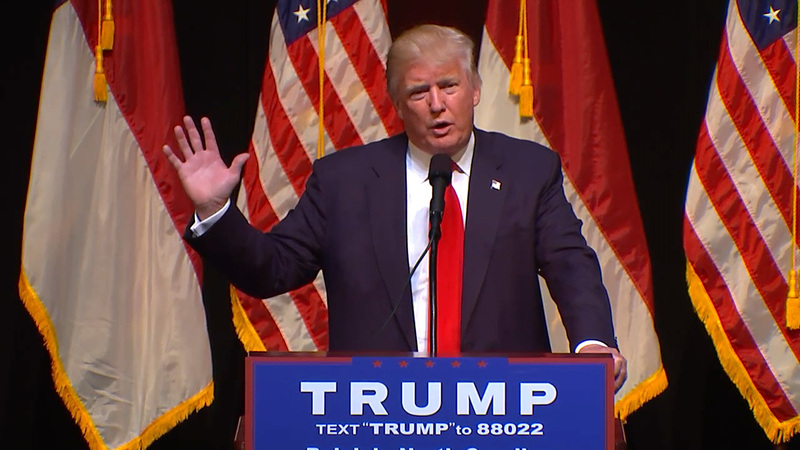 Donald Trump campaigns in Raleigh. RALEIGH -- As soon as Donald Trump walked out on stage at Raleigh Memorial Auditorium, he came out swinging about Hillary Clinton's email scandal. "Today is the best evidence ever that we've seen that our system is absolutely totally rigged," Trump said. On Tuesday, the FBI recommended that no charges be filed against Clinton for using a private email server during her time as secretary of state. The investigation did find that there were carelessly handled classified emails. Trump spoke in North Carolina on the same day Clinton, his Democratic rival, spoke at a rally in Charlotte earlier alongside President Barack Obama. "We're talking about the life blood of our country, the safety of our people," said Trump, who took no time at all is using this ammunition against Clinton's questionable judgment. "Stupidity is not a reason that you're going to be innocent," Trump said. Trump spent more than an hour on stage addressing Clinton's emails and pumping up the crowd with promises to defend the second amendment. He also pledged to protect the nation's borders with his proposed wall to the south and by fighting ISIS. He also told the cheering crowd that he's going to bring jobs back to America, get rid of Common Core and get rid of Obamacare." "Never be able to use it unless you die a vicious and long death," Trump said about Obamacare. Lt. Gov. Dan Forest spoke to the crowd in support of Trump before the presumptive Republican presidential nominee arrived. Gov. Pat McCrory, however, was not present. His office said the governor left the state on Tuesday on a long-scheduled trip with the first lady. Voters line up to see Donald Trump, express what they're looking for in a candidate. People were already lining up more than 12 hours before the event early Tuesday morning. Before Trump's visit, the North Carolina NAACP held a news conference to release an open letter to the presumptive Republican nominee which stated his "campaign presents an extremist philosophy of hate, greed, racism, classism, and xenophobia." NAACP leaders held a news conference Tuesday. It went on to say in part that "Biblical evangelicalism is always rooted in love, mercy, and justice. The alleged evangelicals your campaign appears to court have instead created a borderline heresy that defines morality solely by anti-abortion, anti-gay, pro-gun, pro-tax cuts, and pro-prayer in school policies." The Rev. William Barber read the letter aloud, asking Trump if he will support restoration of the voting rights act in North Carolina and if he supports Medicaid expansion in the state. "What you are saying was only supposed to be in the back room, not on the platform. There is something to be said for candor, but in your case, it is poisoning our civil society." Read more: Company adds profanity to custom Donald Trump T-Shirt. ABC11 asked Barber if there were plans by the Moral Monday movement to attend Trump's evening's campaign event in Raleigh, and Barber said he would not be there - but said other groups had talked about demonstrations. Barber also noted that he would not be attending Clinton's event in Charlotte, however, he said he would be out urging people to register and vote.